Not attending? Follow the IALL action with the hashtag #IALL2012, and the Private Law Libraries section on Twitter: @privatelawlibs. 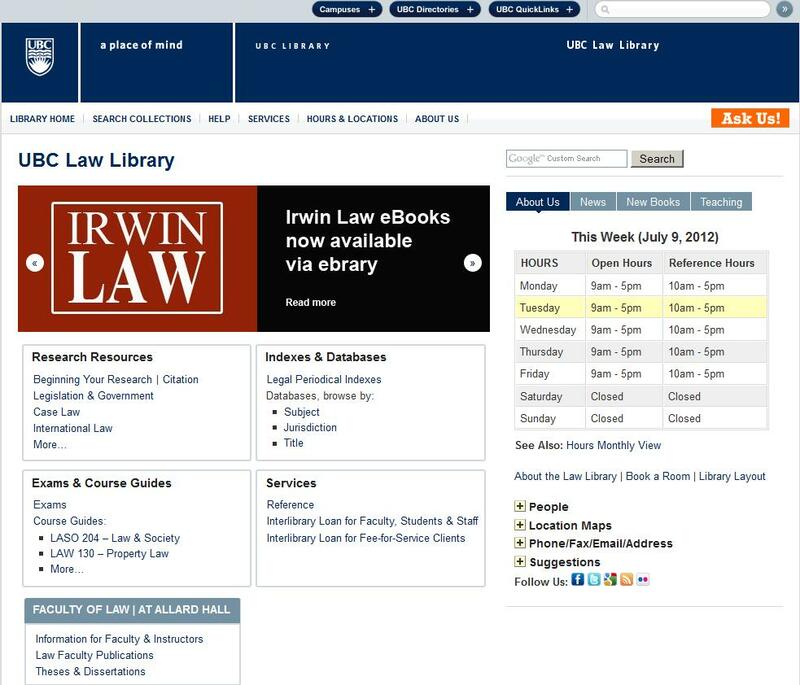 It was revealed yesterday that the UBC Law Library website has had a makeover! The redesigned site has a couple of big improvements, including a calendar on the homepage, highlighting the library's current hours; social media buttons that make the library's facebook and Twitter accounts more apparent; and recent news in a slideshow that adds some nice visual interest to the site. I think online resources such as research guides, indices, and course outlines are much more prominent in the new design. And I like that they've kept the bright orange "Ask Us" button as is. Nicely done, UBC Law Library! Find daily updates to BC statutes and regulations at www.bclegislation.ca.